Part of Shelburne Falls Trolley Museum's mission is to preserve and interpret the historic buildings and other physical aspects of the Buckland Freight Yard. 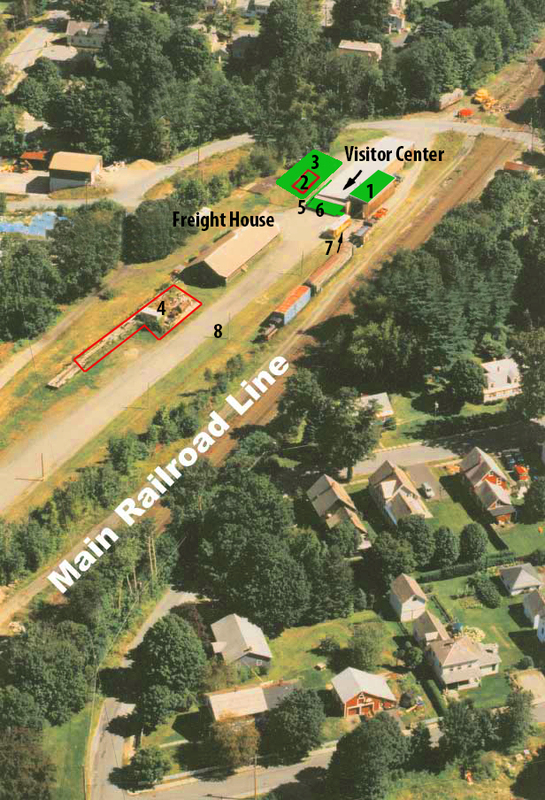 Here is a ca 2004 view of our yard, showing also a little of the village of Shelburne Falls. The Visitors Center and Freight House are labeled. Red outlines show things that have been removed, green shapes are additions since the picture. 5. A ramp for wheelchair access was added in 2006. The passenger car and caboose and box car are beside No. 10. Also evident is the 0-4-0 Baldwin steam engine that was moved to Connecticut Eastern Railway Museum. You may board at either end of the line. The Bridge of Flowers, McCuskers Market and other Buckland shops are just beyond the lower left corner of this picture. Here are some links to pages about the individual buildings, as well as the new Car Barn. Pictures of the old H.P. Hood Creamery, the foundation as we acquired it, and its removal in 2014.
and the 1940's Grain Store/Warehouse/Agway Building/Visitors Center. You can also see some pictures from the 1970's of the yard and buildings here.